I'm currently on cloud nine in Paris. And just spent three days in London - boy, did I miss that city. Danielle and I are concocting plans where I'll live in Paris for a month and learn the language, she'll live in London, we'll each spend a weekend at one anothers' apartments. Good plan. Thanks for all your kind thoughts and words about 28 so far. Clearly things are looking up! Hi Alaina! I just read your last post and you definitely need some chill time in Europe! Hope you're have a ball. I'm sorry about the Sudafed thing...all drugs make me nervous. I think you did the right thing calling the hotline, I never would have thought of that. I feel so bad for Fiona. My dog Milo started having seizures about 2 years ago. He's had about 10 and they last about 5 minutes. We just hold him tight and try to soothe him. We didn't want the meds, the vet said it would definitely slow him down and that makes me too sad. I hope everything works out for the best. So jealous of your guys! 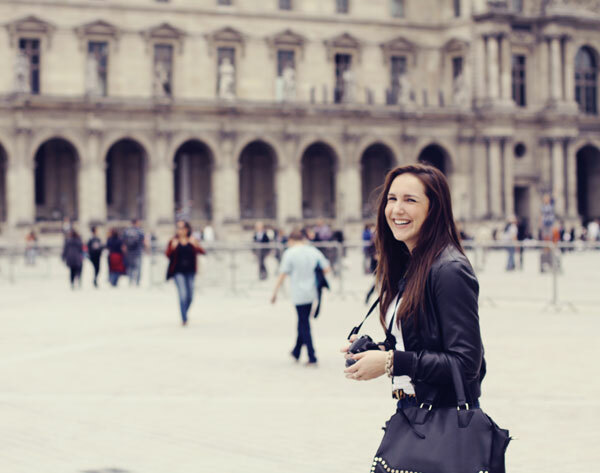 I love your outfit and bag, you look like you fit right in with the chic Parisians. Also did you darken your hair? It looks really pretty! Hello, i just discovered your blog and i like it !! I am a french girl who lives near Paris !! Have a nice trip !! i hope you are having an amazing time! you look like you are in your happy place. :) i like your plan, i want in, i'll live in italy! ps i vote you do another trip next year so i can tag along. i'll bring cookies. That is the most amazing plan! Can I join in?! Looks like your having a blast. I am living so vicariously through these instagrams at the moment!! I have a pretty serious case of wanderlust right now, but while life keeps getting away it's nice to take a little trip through someone else's photos. I'm really happy to see you guys having such a good time! Sounds great! Paris, London...girls really know how to have fun ;) Enjoy! You plan sounds perfect! I hope you're having the best time abroad.